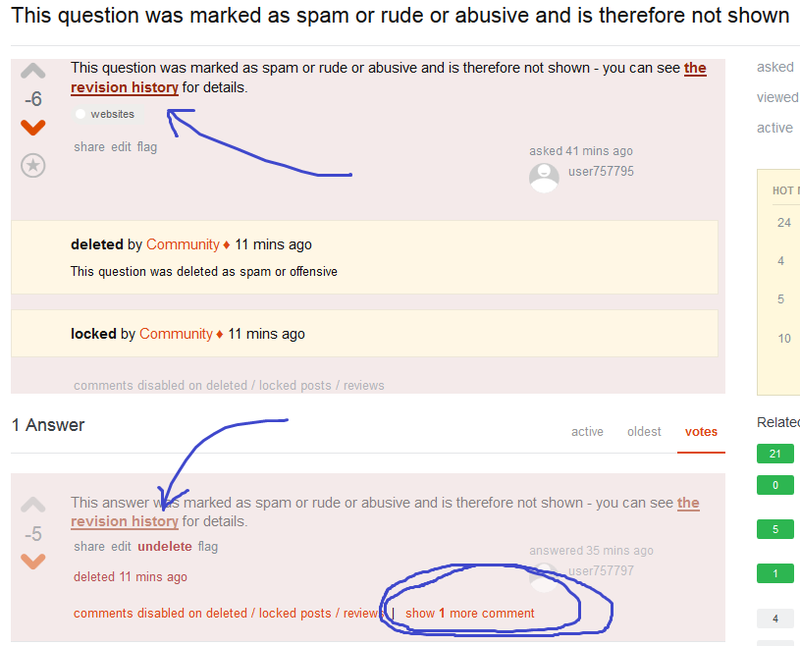 A deleted answer marked as spam shows a "show 1 more comment" link, but clicking the link does not show the comment. Reloading the page does not make the problem go away. The deletion itself is correct, and I absolutely don't want these spam posts brought back, but this behavior from the UI is unusual, and seems like it may be a bug. I'm unsure if there really is a comment, but if there is, it seems to me that there's little value in telling me about it if I am not permitted to view it. Or if it is intended that I should be able to see it, then my inability to do so is the bug. As a 10k user, I can view deleted posts. When a post has a spam or rude or abusive flag raised on it at the time of its deletion, the post body is hidden, which is usually convenient. I am still permitted to view it, however, if I click through to the revision history. Then I can see all revisions of the post, including the most recent one (most often there's only one for such posts, anyway). When I view the page on which the post had appeared and where it is kindly hidden from my comfort, "comments disabled on deleted / locked posts / reviews" always appears after the post. This makes sense, because this appears below all deleted posts, and also because when a post is actually deleted by red spam or rude or abusive flags (six from community members or one from a moderator), the Community bot is what technically performs the deletion, and it locks the post, too. That exact quoted text--"comments disabled on deleted / locked posts / reviews"--appears below locked or deleted posts in other situations. But anyone who may view the post can still view the comments in such situations. So I conclude that it's not trying to tell me that I can't view the comments, only that I cannot post new ones. In contrast, in the case of one particular question and answer that were deleted as spam, I am offered the opportunity to "show 1 more comment" but clicking the link simply makes it go away and turns "comments disabled on deleted / locked posts / reviews" from orange to the usual gray. I'm not sure precisely how the answer was deleted. The first action I took on that question and answer was to downvote them. Their scores were already negative at that time, perhaps from other users' spam flags. Upon further consideration, I felt satisfied that they were spam--with the question as a spam speed and the answer as the actual link-spam payload--and I flagged both posts as spam. My recollection is that they were not deleted immediately as the result of those flags. But they were deleted soon after. Since they both show the exact same deletion time in the tooltip that appears when I hover my mouse pointer over the word "deleted" on each, this suggests the question was deleted due to spam flags and the answer's deleted status is due to the deletion of the question. Perhaps that's the only case where the system's strange behavior of teasing me about a comment I cannot view occurs. Can anyone either explain this or confirm that it is considered a bug? Browse other questions tagged bug comments deleted-questions spam-handling deleted-answers .